These boot cuffs are quick and easy to crochet. The pattern is given in one size only, however with a few adjustments you can crochet these to any size that you need to from toddler to adult. Here is a crochet boot cuffs size chart. This pattern is another addition to the “Pretty Simple” collection. Finished Size: Laying flat they measure 4.75″ across the widest part and 4.75″ high. Can be adjusted for a custom fit. Note: When you work 2 hdc’s into the same stitch or space, think of these as a set or as a V-Stitch. Then when you crochet your next round and the pattern says “2 hdc in sp before next hdc”, work these into the V-stitch – between the stitches made in previous set of hdc’s as pictured. Here is a photo tutorial. Rows 2-28: Ch 1, blsc in each st across. Turn. (7 sts) Continue with this row until you have reached a desired circumference making sure to end in an even number of rows. Rnds 3-6: Rep rnd 2 until you have reached 1/2 inch from desired height. Rnd 8: Ch 1, bpsc in same st as join and into each st around; join with sl st in first bpsc. FO. 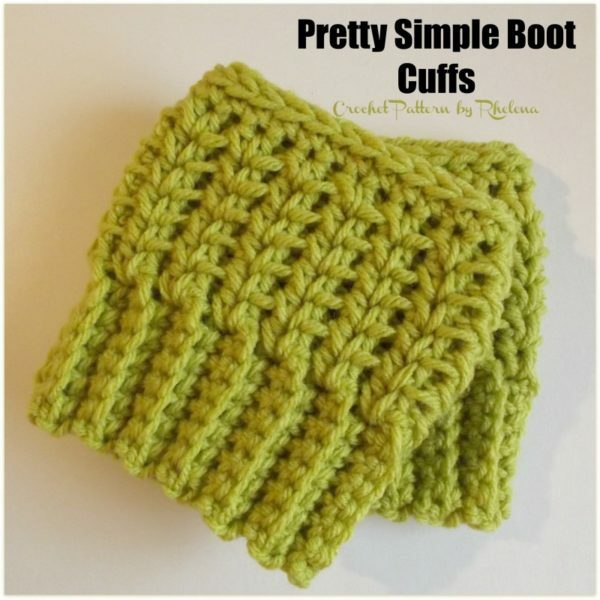 If you enjoyed this, you might also enjoy the growing collection of Free Boot Cuffs Crochet Patterns at Crochet Pattern Bonanza.